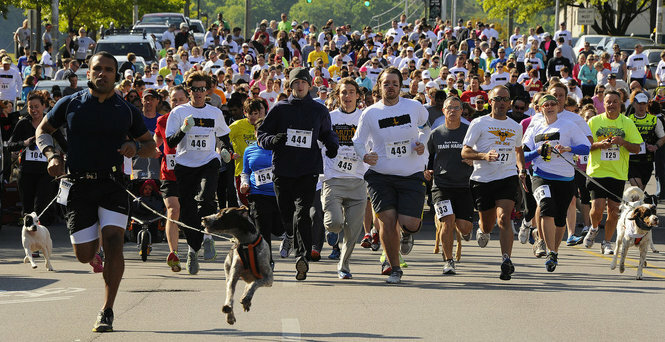 The 6th Annual Mutt Strut will be held on Saturday, April 18th at the Green of the University of Alabama at Birmingham. The day will be packed with fun for not only the avid runner and dog-lover, but for the whole family. From running the 5K, walking the 1 mile, visiting local vendors, to watching agility dogs, you will not only have a great day, but you will also be supporting our local nonprofit! For more information visit the Hand In Paw website. Packet Pickup is from 7am to 8:30am at the start of the race. There is also an early packet pickup available Thursday and Friday (April 16th & 17th) at lululemon athletica from 10am to 6pm.